John Haupert, president and CEO of Grady Health System; Michael Frankel, Marcus Stroke Network Director and Professor & Director of Vascular Neurology, Emory School of Medicine; Bruce Inverso, Sr. VP, American Heart Association; Jonathan S. Lewin, Emory University Executive Vice President for Health Affairs and CEO of Emory's Woodruff Health Sciences Center. Grady Health System, Emory University School of Medicine and the American Heart Association/American Stroke Association Monday unveiled Georgia’s first mobile stroke unit – an ambulance designed to take cutting edge stroke care directly to patients. 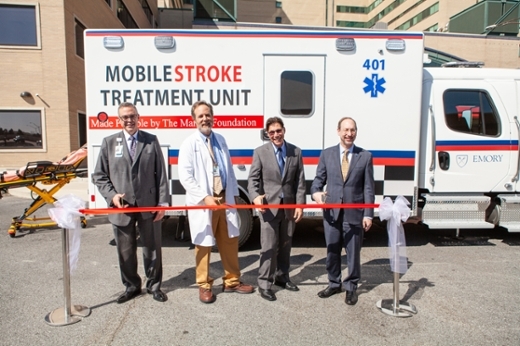 The mobile stroke unit is part of the recently launched Marcus Stroke Network, made possible through the generosity of The Marcus Foundation. The Marcus Stroke Network is a coordinated and collaborative effort to help reduce stroke disability and death rates in the Southeastern United States.